It happened again last week. My patience ran short and my voice grew louder until it reached explosive proportions. The evidence of my outburst was all over the faces buckled in the back seat. I apologized…again. Mommy shouldn’t act that way, even when I’m frustrated. It wasn’t violent. It wasn’t abusive, but it was hurtful and unnecessary. What did it matter if we were a few minutes late, if something was forgotten, or if I didn’t have it “all together” before we left the house? That was no excuse to spill my stress out on my loved ones. I knew deep down that the issue wasn’t my children, their inattentiveness, or their procrastination. The real problem was I was tired. No, I was exhausted. Not the I-need-to-get-to-bed-early-tonight exhausted. Not even the I-need-a-vacation exhausted. This was bone-deep, heart-wrenching, emotionally-and-physically-drained exhausted. In the previous three months, we had weathered the unexpected loss of a parent, major surgery , additional biopsies, and a two-month battle with pneumonia that landed my husband in the hospital for four days. Now the worst was behind us (so it seemed) and everyone was well on their way to health, but I was, quite frankly, out of steam. I was running on empty. For the last three months, we had faced each issue as it came, even though they seemed to only come more quickly. We would put our heads down, so to speak, and power through. We did what we had to do to get through each day. I was tired of just “getting through each day.” I needed a break. But instead of a much-needed reprieve, I was staring through a mountain of medical bills and busy holiday schedule with Christmas just a few, short weeks away. If there is a proverbial edge, I was dangerously close to going over it. The regular demands of parenting are difficult enough to deal with when everyone is well and all the bills are paid. But when your time and energy is consumed with loss, fear of the unknown, looming bills, and a seemingly-endless schedule, the smallest tasks can seem overwhelming. I never doubted we would make it. I never doubted God would see us through physically, spiritually, and even financially. I knew it would all work out; we would be fine. What I couldn’t figure out was how I would make it through today. I had nothing left to give my family. And the more they needed me, the less I felt like giving. But when our world seems the darkest is when God’s grace shines the brightest. When your world seems the darkest, God’s grace shines the brightest. Then words of encouragement from friends…more grace. Moments of laughter over a relaxed lunch…even more grace. Songs of hope on the radio, singing of peace and good will to all…the ultimate Gift of grace. They came piece by piece, building hope and restoring joy. Silent nights watching Christmas lights, heart-to-heart talks with my Hubby (who is feeling so much better!). One by one, moment by moment, they began to give me rest and bring me peace. This had been our “theme song” when we stood in the face of cancer. We had clung tightly to the promise of “His unchanging grace.” Now, I realized it’s time to hold tightly to it once again. It’s time to remind myself that it doesn’t matter what my circumstances are. It doesn’t matter how I feel. All that matters is that God is still in control. If I hold tightly to Him, I will make it. His grace is big enough to carry me through cancer, and it’s big enough to get me through my day. God’s grace is big enough to carry me through cancer, and it’s big enough to get me through my day. What overwhelming situations are you facing today? 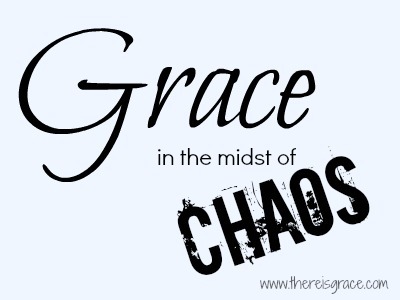 May you find God’s grace in the midst of it all. those times when you got nothin left. and i always wonder how it is that Christmas finds me again, poor in mind and spirit? and then i remember the promise — like the grace you mentioned. it is for the poor. and the needy. and perhaps the one qualification to receive the overwhelming grace is that deep bankruptcy your words carry in this post. empty comes before the fill. thanks for sharing the grace. this is our mission, to herald these moments when we’re brushed by Eternity. thank you. glad i stopped in from tuesdays unwrapped. These are soothing words to my soul. While I have not faced the trials you have recently faced, it has been a hectic time filled with helping family move, stomach bugs, my first case of strep and first ear infection (which is still making me crazy), much hustle and bustle of the season, car issues, and always the unexpected expenses. Through it all God gives grace. It never fails. I don’t know why I worry so much. His grace is always there in every season of life. Hugs to you, dear friend! No matter what we face, it is made worse by sickness. Hope you are feeling better soon and praying God’s grace sustains you in the meantime! So thankful you found encouragement in these words. Love you, girl! “But when our world seems the darkest is when God’s grace shines the brightest.” Beautiful words!!! Thank you, Kat! And thanks for stopping by! I found your blog from Chatting with the sky’s link up. “But when our world seems the darkest is when God’s grace shines the brightest.” Such a heartfelt post and such true words. So thankful for His grace. His anchor does hold indeed. Mindy, thank you so much for stopping by and for your kind words! I applaud you for sharing your heart in the difficult times and for apologizing to your children when you needed to. We have to model what that looks like and help teach them to learn to forgive. It takes a humble mother to do so! I’ve been where you are, maybe not the exact same circumstances, but when the challenges pile on and exhaustion sets in. What a friend we have in Jesus!